This past October, the development duo of Pixelbite and Polarbit brought us Reckless Racing [99¢/Lite/HD], a top-down racer with beautiful graphics and fun arcade-style physics that we really enjoyed in our review. Then last week, the developers announced a follow-up title to Reckless Racing titled Reckless Getaway [$2.99], a game with a similar visual style and floaty physics system but with a focus on escaping capture from the police while causing a ton of collateral damage along the way. 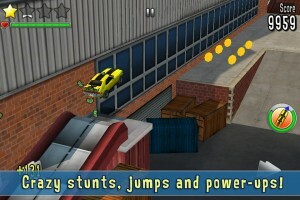 The developers had stated that Reckless Getaway was inspired by classic titles like Spyhunter and the Burnout series, and you definitely could see that inspiration in the trailer for the game. Though there was no release date announced along with the trailer last week, we were pleasantly surprised to see Reckless Getaway show up in the App Store later that day. After spending a good amount of time with the game, and even talking about it on our most recent podcast, I’m really pleased to report that Pixelbite and Polarbit have succeeded in bringing some of the best aspects of Reckless Racing into Reckless Getaway while offering a very different gameplay experience. There are a couple of quirks here and there, and an extra dose of content couldn’t hurt, but for the most part Reckless Getaway is an intense arcade experience with a ton of replay value that’s easy enough for anybody to pick up and have a great time with. There’s really no story to speak of in Reckless Getaway, but all you’ll need to know is that you’re the driver of a getaway car following a robbery and you must evade a police pursuit on the way to the end of each of the game’s 16 levels. There’s no gassing or braking to worry about, as the game handles this part for you. The only thing you’re responsible for controlling is the left and right steering, either by tilt or arrow buttons on either side of the screen. 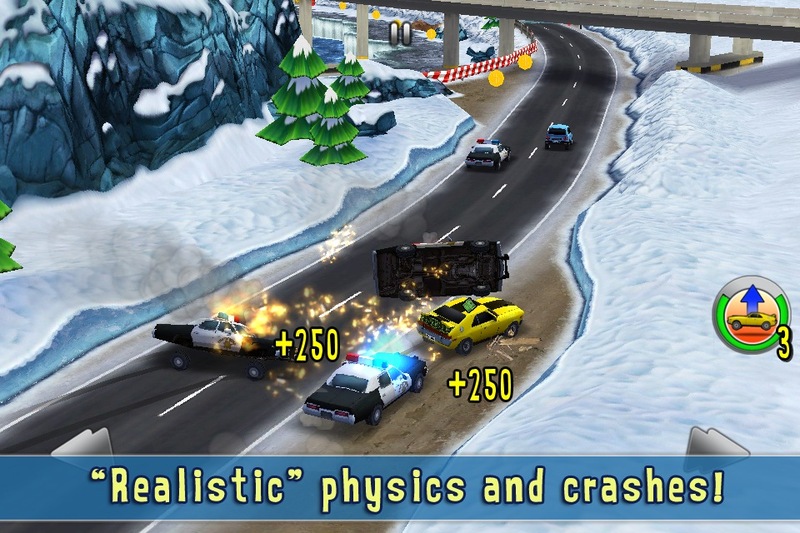 During your getaway, you’ll earn points for a myriad of activities, including driving against traffic, collecting coins, launching off one of the many jumps carefully placed in the terrain, and of course for getting the cops off your tail. As you earn points for these actions, a set of 4 stars will slowly fill at the top of the screen, and your score is based on how many stars are filled by the time you cross the finish line. It’s in this star rating system that Reckless Getaway gets its replay value, but also where it limits its accessibility. Just getting from the beginning to the end of a level isn’t too difficult, but earning enough points along the way in order to gain 4 stars is a real challenge that will require many replays of a level as well as memorization of where the different point-earning items are. On one hand, I really like this aspect of the game as it forces you to pay attention to the details of a level and rewards you for making a clean and efficient getaway. On the other hand, I’m not a huge fan of how unlocking new levels depends on earning a certain amount of stars, and since it can be pretty hard to earn stars you’ll likely be stuck replaying the same sets of levels many times before finally unlocking more levels later in the game. It’s not a huge issue, but I’d appreciate a more forgiving way to see the advanced levels in the game, and then have the option to go back and earn 4 stars on previous levels if I choose to. As it is now, sometimes I feel forced to perfect a level even if I’m not ready to just to earn an extra star or two to keep progressing in the game. The thing that makes the odd progression structure easy to forgive is that Reckless Getaway is just damn fun to play. Just about every playthrough of a level feels like a high-octane chase scene from an action flick. The floaty physics and touchy steering ensure that you’ll pinball off of traffic and the many hazards in the terrain, making for plenty of memorable moments. The handling is about as far from a simulation game as you can get, but this actually benefits the arcade nature of the gameplay. One thing Reckless Getaway could really benefit from is some sort of endless or freeplay mode where you could just drive fast and cause destruction to your heart’s content. For such a simple arcade game, Reckless Getaway actually contains quite a bit of depth and strategy in obtaining every star. If you’re just looking for some mindless vehicular mayhem, then it delivers that in spades as well. Those looking for a more traditional racing game may choose to stick with Reckless Racing, or hang around for the proper sequel Reckless Racing 2 which has Pixelbite has confirmed is already in progress. 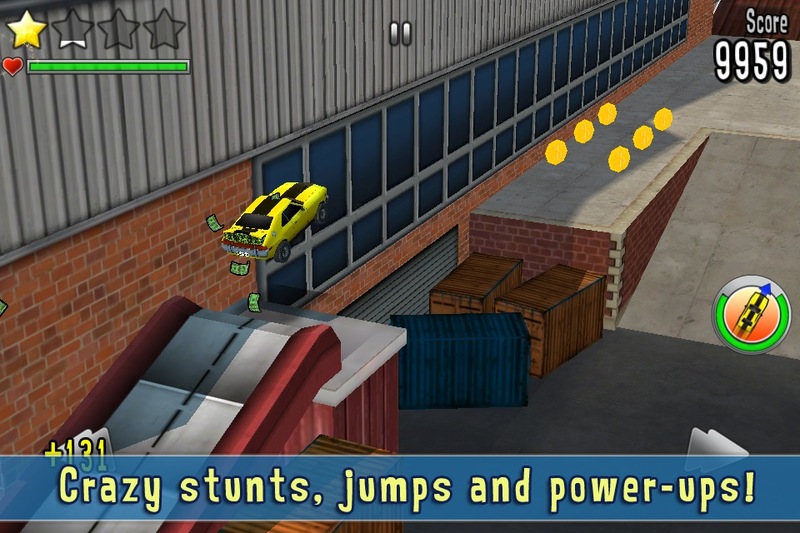 Players in our forums have had tons of positive things to say about the game, and for some high-action arcadey gameplay Reckless Getaway is one to check out.